Location: Situated in its own grounds and approached along the N drive or through the stable courtyard to S. Faces E with terrace to W.
Built c.1770 for John Bartlett Allen, the wealthy owner of local coal mines. The architect is unknown but the restrained, elegantly proportioned villa design is characteristic of later C18 Palladian-inspired architects such as Anthony Keck, Sir Robert Taylor and Robert Mylne. Nevertheless, regional Georgian architects had successful country house practices employing the villa model; one such London architect was William Thomas, from a Pembroke family, who designed Brownslade (now demolished) in 1780s which has design similarities to Cresselly. The first changes to the house were made by John Hensleigh Allen MP in 1816-18 when the present staircase was built by William Hoare, architect of Lawrenny. Subsequent alterations are most notably the wings added in the 1860s; this work was carried out by Clarke and Holland of Newmarket, Suffolk, who were chosen because they were architects to Lady Allen's brother, the Earl of Portsmouth. About the same time the park was remodelled and many estate buildings erected. 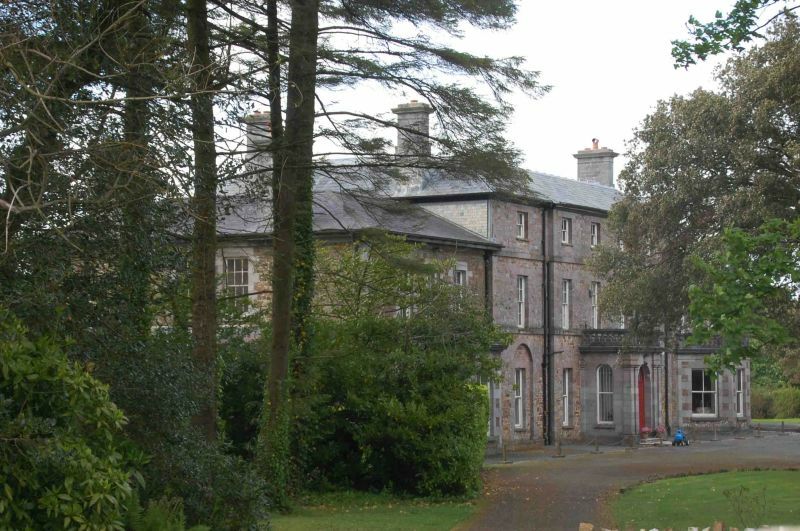 The c.1770 main block has a symmetrical, 3-storey, 5-bay coursed rubble front, the central three bays of which are advanced; freestone quoins, band courses and window dressings. Slightly set back to either side are 2-storey, 3-bay wings that relate to the 1860s enlargement and have uncoursed rubble elevations and simpler dressings; the porch is also of this period. Hipped slate roofs and tall stone chimney stacks; moulded eaves to main block and wider boarded eaves to wings. Small-pane sash windows throughout; interestingly, those to the wings are unhorned, perhaps to blend in with the original windows. By contrast the ground floor windows on the main block were altered at the time of the enlargement giving the main rooms 4-pane sashes; those to the outer bays are set within tall semicircular-arched recesses (a popular Palladian motif). The first-floor windows above have also been modified through the lowering of the sills even though this meant colliding with the top of the band course, which is, as a result, slightly cut back beneath each window; the rear elevation shows the size of the original first-floor windows. 6-pane windows to second floor. The porch has twinned pilasters and round-arched openings with dropped keystones to each side; balustraded parapet, panelled door and plain fanlight. The wings have splayed bays with dentilled cornices and balustraded parapets. On the garden front the central three bays are advanced and deeply splayed forward under a hipped roof in a manner that particularly recalls the work of principal architects of the period, e.g. Keck at Penrice (Gower), Taylor at Ottershaw (Surrey) and Mylne at Bringwyn (Powys). The outer ground floor windows are again set in semicircular recesses although the window detail differs, the tripartite window to the left with round-headed central light appears to be a modification of the broader Venetian window to the right; as the left-hand window lights the library it may have been narrowed to allow more wall-space for bookshelves. Splayed ground floor bays to the wings and the slate-hung end elevations have lean-to's with shaped parapets and doors onto spinal corridor. Offset entrance at SW corner of a panelled, rectangular hall with triglyph frieze, cornice and lugged marble chimneypiece. Along the back of the hall is a corridor with round-arched, keyblocked, openings; this runs the length of the house and gives access to the main rooms. To the right of the hall is the cantilevered, openwell, timber staircase which is lit by a lantern and has cast-iron scrolly uprights; the staircase is documented as having been built in 1816-18 by William Hoare of Lawrenny and the wrought-iron balustrade made by William Moss of Carmarthen. To the left of the hall is a space that may be the site of the staircase to the original, 1770s house. In the main block of the house the principal room on the E side is the panelled dining-room with reeded dado rails, modillion cornice and Rococo plaster cartouches. On the W side directly behind the hall is the drawing-room, the finest room in the house, occupying the full width of the bay on the garden front. It has a finely executed Rococo plaster ceiling, the decoration of which includes an egg and dart cornice and a cartouche with musical trophies together with an open score; there are close similarities to a ceiling at Park House on the Stackpole Estate. This room also retains a fine marble chimneypiece and has been given silk wall-hangings and panelling in the Edwardian period. To the right, entered opposite to the staircase, is the library with its fine mahogany bookcases, some bays of which have ogee-arched cupboards beneath 5-tier shelving; these were made by William Owen of Haverfordwest contemporary with the 1816-18 alterations. This room also has a carved wooden chimneypiece, egg and dart cornice and Edwardian oval plaster ceiling swag. To the left of the drawing room is the study which retains full original panelling with raised fields. The main rooms in the wings are the morning room to right on the W side with marble chimneypiece and anthemion dado and the panelled billiard room to front. The wing to the S includes the kitchen, offices and back stairs, which between first and second floor is of Chinese Chippendale type; this may be a reuse of the original 1770s staircase and is one of a small number of local examples of this style. Throughout the interior, original Georgian detailing is retained including cornices, panelled shutters, doors and architraves &c., and the spinal corridor is repeated on the first floor with similar arched doorways. Some panelled bedrooms. In the cellar there is a beam dated 'H 1771 H'. Graded II* as an exceptionally well-preserved country house of particular interest to the architectural and family history of West Wales. The stable courtyard is immediately to the S of Cresselly House. This range is on its W side, opposite the coach-house and another stable range. Slightly set back from the main road and adjoining the N lodge. Flanking the N side of the gated N drive to Cresselly House. Set back slightly from the main road and formerly closing the E driveway from Jeffreyston to Cresselly House.